People associate Baguio City with it's year-round cooler temperature than any metro in the country. But for me honestly, Baguio City is all about food. 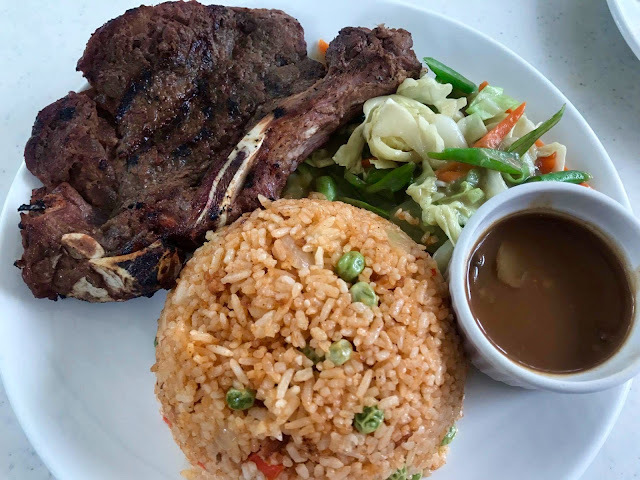 With it's mild and cool climate, perfect for growing the freshest produce, Baguio City boasts of its high grade greens and veggies which makes every single food item a magical ingredient. We were supposed to go to the Ilocos region in celebration of my cousin Judy's birthday, but we decided to cut our trip short and visit the Shrine of Our Lady of Manaoag in Pangasinan. After we heard mass and said our prayers to Mama Mary, we decided to go up the Cordilleras and have lunch at Baguio City. Baguio City is nestled atop the province of Benguet, in the Cordillera mountain range, the reason why it has way better temperatures during these hot months, also the reason it is dubbed at the Summer Capital of the Philippines. 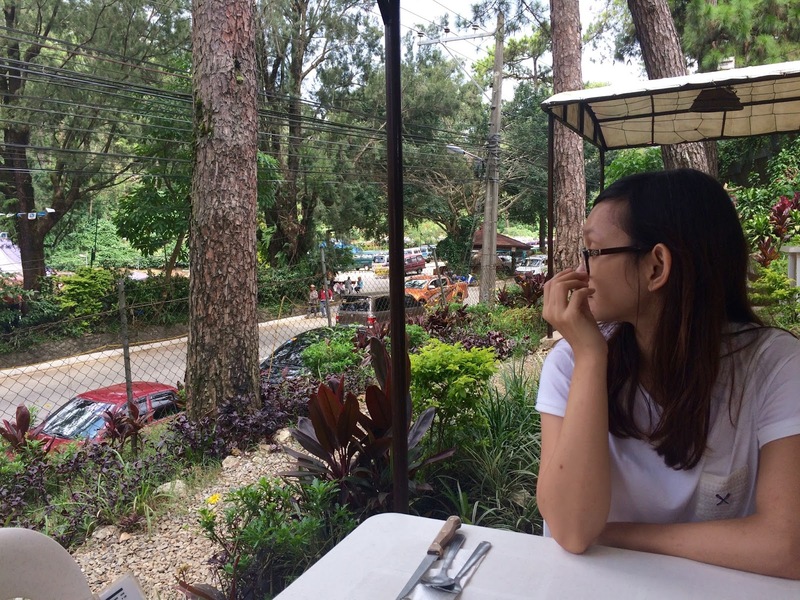 Located roughly 246 kilometers north of Manila, we reached Baguio City in search of Lunch. Yes! We drove all the way up (5,000 ft altitude) just for a good and hearty lunch. Quickly, we have decided to have it at Pizza Volante. 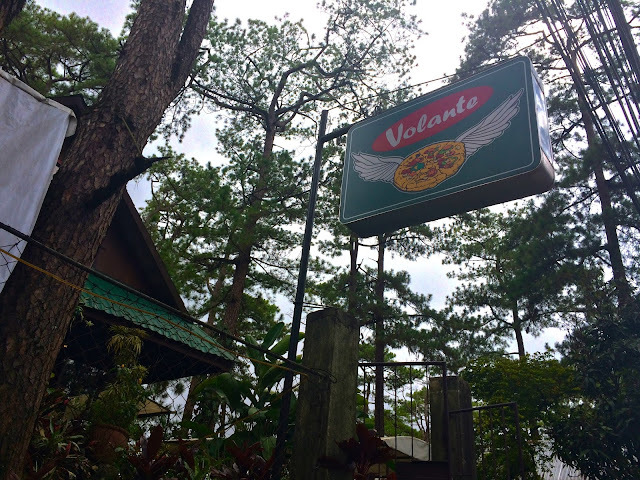 Around 9 years ago, me and my brother Wilson went up to Baguio and have tried Pizza Volante on their Session Road branch so I suggested we try their food the their place just in front of the famous Wright Park, near the Mansion. The place is cute with a log-cabin inspired store with quite a few outdoor seats. We opted to be seated outside to enjoy the beautiful cool afternoon that it was. It was around 2 in the afternoon but the temperature is a perfect 24 degrees. Our kind server asked us for our orders and just as usual, we ordered all the same thing. But aside from our steaks, we also got a plate of pasta and a pan pizza for sharing. Note: Since the restaurant is located just across Wright Park, where horseback riding is an popular activity, we recommend taking the indoor tables. But since the stench that time was not that strong, we seated comfortably on the outdoor seats, chatting right after we said our orders. We all ordered Porterhouse Steaks - all three of them had theirs Medium Well and mine, my usual Medium Rare. Let me run you through the dishes we had that lunch time. 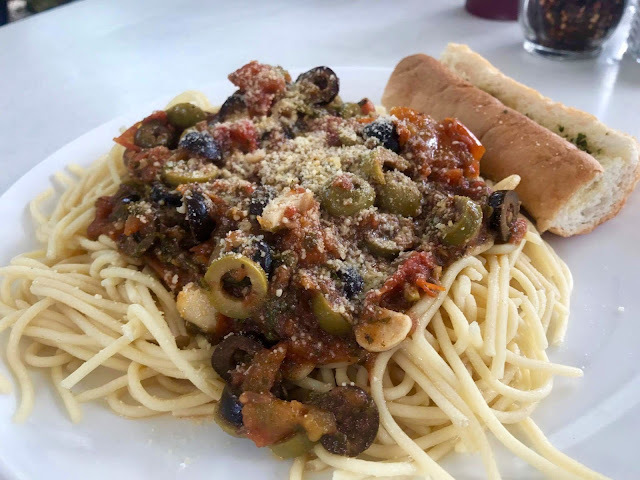 Spaghetti Pasta topped with sauce made of Tomatoes, anchovies, black and green olives, and topped with parmesan cheese. Since this is a pasta dish, let me start with the noodles. It was a borderline of good and soggy. The consistency was passable but I have to be honest, it does bother me every time I chew on it. But the sauce was another story. It was seasoned well, just perfectly to bring out the real taste of its ingredients. I also have to commend the amount of time that they used to cooked the sauce because the tomatoes and olives are not too chunky (I hate sauces with undercooked veggies - it's a sauce ok, not a salad). So overall, I think this was a good dish, but yes, the mid-soggy noodles were a bit bothering to me. So this was our main course, four plates of this one, each for one of us! This was a little disappointing for me. This one was served cold. I mean, not the cold cold from the fridge of course, but way colder than how you should serve a newly cooked meal. For the price of 229 pesos, which was super cheap for a 250 g steak to be honest, it was okay. But still, even for a low price, they should have done better. Served with gravy, corsican rice, and mixed vegetables, I thought I was the only one with the cold steak since I ordered Medium Rare, but even for my friends who ordered it Medium Well, they did have the same findings. At first I thought it was the weather that it made it so cold so fast, but I don;t think it is since as our kind server handed us the plates, we started to dig in. As per the menu, this were grilled over Lava rocks, so maybe I thought this is how it ends up when you cook them in that way. But I'm sure they can do so much better than this one. I think they should cut the steak proportionally too as to distribute the heat evenly , because my steak in particular, has a big flap of meat over the other so when I opened the fold, it was too rare on the inner parts where-in I can still see the shiny silvery things aside from the expected bloody finish. From a disappointing dish, let's move on to our last dish that did made me smile. Really, their pizza is their forte. From the perfect texture of their cheese (not just because of a high grade cheese but because of the perfect amount of time to melt it) to its amazing dough, this is a delight! I mean, just take a look at that photo above. You can see how perfectly kneaded the flatbread is on its crust. Not too thin but not too thick. And unlike the steak, this was served on a better temperature (still not perfectly hot though to tell you the truth). Note: You can order your pizzas half-and-half (half of a flavor and half of another) on their 10 inch pan pizzas. This oven-baked dish really saved the day for me. 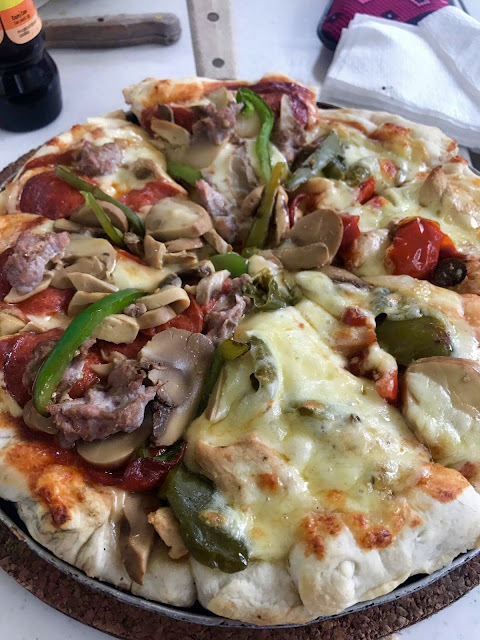 If not for this pizza, I wouldn't have written this article about our lunch at Volante but hey, I guess with this, they can do a better job on their other dishes, and not just with their Pizza. 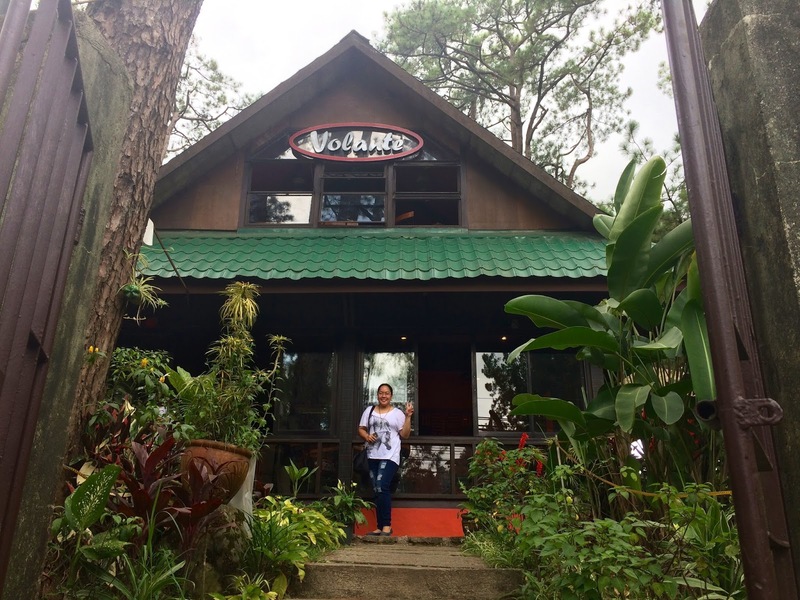 Will I go back to Volante the next time I visit Baguio City? Probably yes! Will i order steak again, maybe I'll pass on the steak. But Pizza? Definitely! They still have a lot of pizzas for me to try which really gave me a hard time what to choose - Sardines and Mushroom Pizza, Chili con Carne Pizza, and Pizza Putanesca to name some of their works of art.